In Bonds: The Unbeaten Path to Secure Investment Growth, Second Edition, the fully revised and updated edition of the classic guide to demystifying the bonds market, veteran investor husband and wife team Hildy and Stan Richelson expose the myth of stocks' superior investment returns and propose an all-bond portfolio as a sure-footed strategy that will ensure positive returns. Designed to educate novice and sophisticated investors alike, as well as to serve as a tool for financial advisers, the book explains why and when bonds can be the right choice. Case studies, detailed bond strategies, and a financial planning overview bring home the value of bonds in achieving financial goals. Presenting a broad spectrum of bond-investment options, and describing how to purchase bonds at the best prices, the book shows how to make real money by investing in bonds. The strategies presented here are designed to help the reader determine how to use bonds to take control of their own financial destiny. With more bond options available than ever before, Bonds continues to be a must-have for anyone looking to understand the investment opportunities available to them. The advice of HILDY RICHELSON, PHD, and STAN RICHELSON, JD, LLM, on bond investing is sought across the United States by individuals, financial advisors, and the media. As nationally recognized bond advisors and financial authors of five bond books, they have translated the complex world of bond investing into diagrams and layman's language, enabling motivated investors to take control of their financial lives. Scarsdale Investment Group, Ltd. restricts its practice to the design and implementation of bond portfolios for high-net-worth individuals. 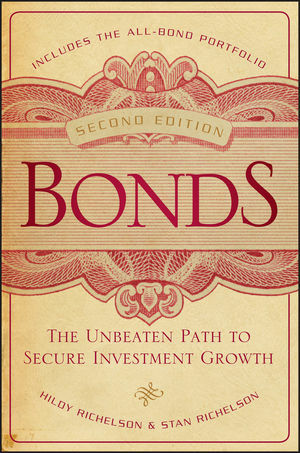 Visit their website at www.allbondportfolios.com and sign up for a free newsletter to receive updates on bond market trends. —Kent R. Addis, Jr., President, Addis & Hill, Inc.
—Jeffery B. Broadhurst, MBA, CFA, CFP, President of Broadhurst Financial Advisors, Inc.